Something is disappearing in our world today, and I believe it is the disconnecting from our feminine heart. I believe the Blessed Mother is crying for us to go out and mother the world around us in every way that we can. I'm writing today to honor women, and hope to help them understand their feminine worth, along with the morals and values that I believe makes girls into the women we become. The most important development happens when we give birth. In the beautiful words of Henry Ward Beecher, "The mother's heart is the child's schoolroom." I believe this parallels with the personification of the Blessed Mother. Some people have called me an enabler. If you, too, feel that you're always serving others and are viewed as an enabler, this is something important to take a closer look at, especially considering what's going on in our society today. The significance of unequivocal kindness, loyalty, forgiveness, dedication to God and trying to live as our Blessed Mother did is nearly impossible for any of us to understand. But I have witnessed wise women who have suffered the way the Blessed Mother did over her Child, and sadly these mothers are now viewed as lacking in common sense. This is wrong. Sometimes a mother has to raise her children alone. 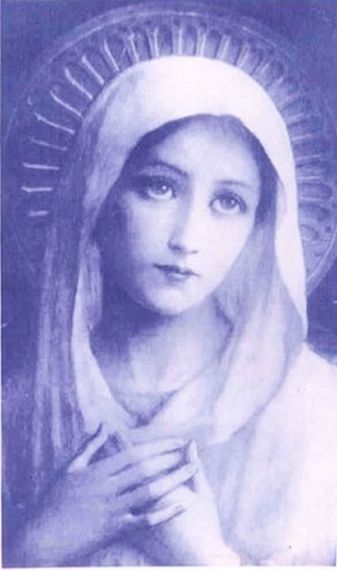 And through all her distress, sorrow, and suffering, the Blessed Mother's example is the epitome of sanctifying grace those mothers can rely upon for her children and her own survival. This fact might be the real reason for the lack of value and respect that some men display these days. They don't honor a woman's worth and value today because women have been encouraged to go after other things. But I'd like us to examine this trend carefully together because it seems that the absence of love and respect for women has hurt us. It almost has to hurt us to allow us to understand this mystery of dependency that we all have on our mothers. This is our first and truest saving grace. However, those few women who remain true to this dedication to Our Lady come through their own suffering to understand that there is a moral authority over us to whom we are all accountable. For some women, loving and protecting her children might be the only genuine force of love that is keeping her mentally and physically healthy; it may be the only reason that any of us is even surviving in society today. What kind of woman is this, who has such confidence, and where does this insight come from? She is a woman who believes in doing what's right for her children's sake, even if it means doing without herself. She is far from being an enabler. Rather, she answers the cries for help from both women and men, but mostly for her children. Such a woman personifies the sufferings of the Blessed Mother. She has a background of understanding, experience and forgiveness, and the courage and wisdom that go with those traits. And that's exactly how we need be to move forward in this challenging world. The heart of a mother helps us understand the significance of this message of understanding, courage, wisdom and forgiveness, especially with so many absent fathers today. My own dear mother deprived herself and suffered for her seventeen children, and we all thrived through her sacrifice and grace, and so did our father. We need to keep this passion burning in our own families the way others did for us, regardless of what society tells us to the contrary. I believe that having a child changes us in many ways and adds to our understanding of the beauty that stems from our sexual nature. Only a mother's heart knows how she's changed when she gives birth to her child; she now must put herself and desires aside because this child exemplifies her greatest opportunity to grow in heart, mind, and soul. Being a mother might make us more aware of all the sorrows in the world around us, but this huge responsibility will also keep our morals and souls intact for the betterment of all those in our care. Mothering might just be what we all need to control our own natural promiscuous urges and desires. Living these truths is not always easy, but it's the right way for men and boys to see and respect women and girls, and to esteem and honor them. I hope and pray that all men and women will remember those sacrifices that brought them forward in their own lives. May they bear witness to those who have helped them and remain true to the pure heart of mothering to keep us stronger together. This is what I believe the Blessed Mother's suffering and sacrifice are meant to teach us.